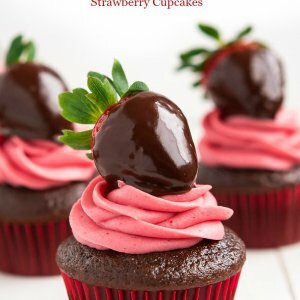 Chocolate Covered Strawberry Cupcakes - a perfectly moist chocolate cupcake made from scratch, topped with a homemade strawberry frosting and a strawberry covered with chocolate ganache! A perfect Valentine's day treat! Pour ¼ cup batter into each paper liner. Bake for 15-18 minutes or until toothpick comes out clean.